Sprint Electric presents its range of digital DC drives up to 2250 Amps. 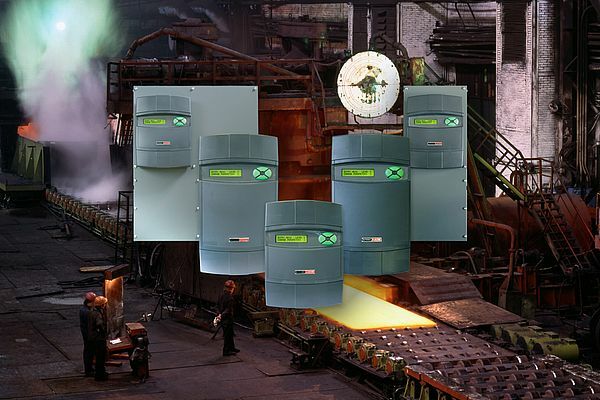 These digital DC drives are good for controlling DC motors used in heavy industry applications such as metal working, steel mills, mining, or the cement, rubber and plastics industries. Thanks to the new control technology drive.web, the drives can be controlled over the Ethernet without the need for a PLC or supervisory computer. The DC drives of the PLX range are available as two quadrant or regenerative four quadrant types. All models ranging from 650 to 2250 Amps (980 KW/1320 HP) are offered with two AC busbar position options: Either top entry or bottom entry. This means that for retrofit installations the two options make it easier to use the existing cabling and will save the cost of adding more expensive copper cabling. In new designs, the engineer has the choice of wiring options, which can save money and space when designing new control panels. This increased drive range is available as high voltage (690V AC) or standard voltage (480V AC) models. A 690V AC supply allows the use of 750V DC armature motors. Compared to the standard voltage this provides an increase in shaft power, up to 1500 KW/2000 HP for the 2250A model. That is 50 percent more power delivered without an increased cable size. The drive has an extensive range of software functions and fieldbus communications options such as Profibus, DeviceNet, CC-Link, EtherNet/IP, Modbus and CANopen. The Ethernet-based drive.web control system includes graphical configuration tools that provide diagnostics and configurability of all drives on the network, either locally or remotely via the Internet. The graphical tools allow the full configuration of the drives, provide service diagnostics, full documentation and an operator interface for local control. The ageing control system of a famous rollercoaster was becoming costly in both maintenance and downtime. Chessington World of Adventures needed to improve the ride’s reliability ahead of the summer’s peak-season.